This document has been prepared for the Namche Bazaar Conference to be held from 22-26 May 2003, in conjunction with the celebration of the 50th anniversary of the first ascent of Mount Everest by Sir Edmund Hillary and Tenzing Norgay Sherpa on 29 May 1953 . This is a working document and not an official publication of the Netherlands Development Organisation (SNV). This document, along with the other conference presentations, will be available on CD-Rom. SNV-Nepal provides integrated advisory services and access to finance for local and national development organisations in Nepal , including private sector operators, NGOs, community-based organisations, local and national government organisations. Depending on the character of the advisory services, international technical or management expertise can be contracted through the SNV-Nepal. The advisory services of the SNV-Nepal will be made in the context of the national development needs in Nepal and shall consider good governance, poverty reduction, gender issues and environmental issues. 1) the Biodiversity Sector Programme (BISEP) is an integrated rural development programme that supports government and local organisations in developing sustainable and income generating projects in forestry and nature conservation regions. 2) the Renewable Energy (RE) Programme supports the sub-sector development of the Biogas industry through the Biogas Sector Partnership (BSP). BSP assists the biogas sub-sector in subsidy channelling, development of industry standards, research, programme management and quality control. The RE Programme also supports the sub-sector development of ghatta’s (traditional watermills) towards Improved Water Mills (IWM). The RE Programme can assist in matters related to solar energy applications, thermal insulation and heating equipment. PSD: Private Sector Development Programme links micro and small enterprises to natural resources and provides institutional development, technical and management advisory services. LGSP: Local Governance Strengthening Programme supports in coordination with other national and international organisations the ongoing decentralisation and women’s rights. SPAN: Small Projects Assistance Nepal provides coordination for advisory services by experienced business managers from divers technical backgrounds on short-term contracts to local industries. The document is the result of a mission to Lukla/Mosi (8,000 ft. / 2634 m) and Khumjung (11,800 ft. / 3882 m) in the Khumbu region and contains observations about the use of the Beehive charcoal briquette stove for cooking and space heating. The Beehive charcoal briquette stove has the potential to become a practical source of renewable energy (RE) for domestic use, hotel owners and trekkers in high altitude camping grounds. Currently large amounts of kerosene is being brought into the region to satisfy the need for cooking energy and for use in Everest Base Camp. The observations in this report are related to the potential use of biomass charcoal briquettes and improved briquette stoves at high altitudes in Nepal. With proper application of the available technology, biomass briquettes can be a means of providing a convenient source of energy for cooking and space heating, substituting the need for kerosene which is a non-renewable energy source subsidised by the Nepalese government. The need to improve the locally manufactured biomass charcoal briquettes has been also identified by WWF Nepal Programme. The same problems in the supply of energy exist in similar high mountain regions, such as the conservation areas managed by the WWF-Nepal Programme and the King Mahendra Trust for Nature Conservation. 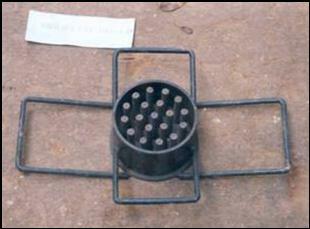 The charcoal briquettes are manufactured from agricultural residue and forest waste products. 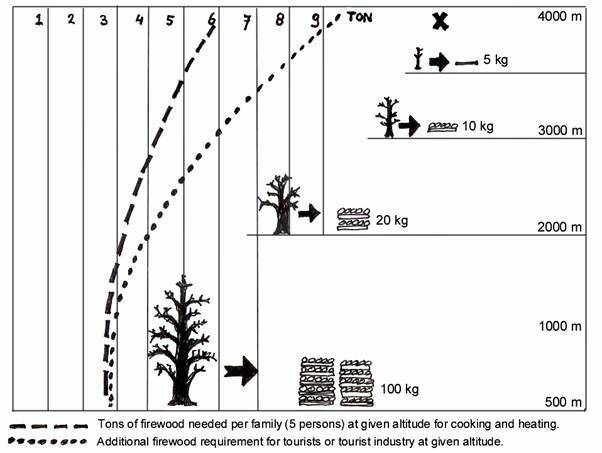 High firewood consumption for domestic cooking and heating purposes is depleting forest reserves because at the higher altitudes, where tree growth is considerably slower than at the lower altitudes such as in the Terai, regeneration of firewood cannot meet the demands. The author looked at some of the technical, social and financial implications of the produced briquettes and stove. · Mr. Kamal Rijal, Renewable Energy Specialist, ICIMOD and ICIMOD Research and Demonstration Centre in Godavari. · Mr. Lumin Shrestra, Director Centre for Rural Technology-Nepal (CRT/N). · Dr. Krishna Raj Shrestha, Chairman Centre for Energy and Environment (CEE), who has conducted training programmes on briquette making and stove manufacturing. · Mr. Sanu Kaji Shrestha, Chairman, Foundation for Sustainable Technologies (FoST). · Mr. Rinsje Sherpa, WWF Nepal Programme Coordinator in Pandung, Khumbu region. http://listserv.repp.org/archives/stoves.html A stove discussion forum is available through the same website. Timber, needed for the construction of housing and hotel accommodation. As a measurement to reduce firewood collection for use in the tourist industry, travel organisations are now obliged to import kerosene into the region for heating fuel and to carry this kerosene to the mountain base-camps. Cutting of firewood has been recently prohibited (year 2002). The local population is allowed to use, to a very limited extent, deadwood (branches) for local firewood needs, collect forest waste products and use cow dung 2]. In Pandung, the Lukla women group has undertaken the production of the Beehive charcoal briquettes as a cottage industry in areas where the invasive shrubs are in abundance. The product has limited application, however, and has had marginal economical success or impact. A five-day hands-on training was provided three years ago with the assistance of the Centre for Energy and Environment (CEE), which had developed a Nepali training programme on the subject. Briquette making involves manpower in the informal sector, thus providing an income generating activity. The Beehive charcoal briquettes are made from charcoal produced from agricultural residues, such as rice husk, wheat chaff and forest “waste” vegetation (fallen pine needles, pinecones, grassy weeds, Banmarachar shrubs, Lantana camara, etc.). This is an efficient method of utilizing bio-waste. All woody biomass material can form the raw material for charcoal briquettes. Emphasis should be placed on using agricultural residues and invasive biomass. Increased demand for fuel wood has resulted in an increased area of deforestation. Invasive plants have taken over these deforested lands due to their rapid growth. In some cases dried cow-dung cakes have been added, but this is strongly discouraged as it is far more beneficial to use the cow dung for fertilizer purposes. Cow dung is preferably processed in a biogas reactor, which provides clean gas, whereas the slurry still contains the fertilizer that can be used for agriculture. The biomass material is first sun dried until it has a humidity below 15%. It is then heated in a 220-litre metal charring drum. The resulting charcoal is ground to dust and (in Pandung) mixed with 30% dry clay-soil (in volume). Water is then added to make a paste. Using a 5 kg hand weight, the paste is compacted into a round mould. The 19 round pins create 12 mm holes throughout the height of the charcoal briquette after de-moulding. These holes not only allow the briquette to dry evenly, but they also result in an even burning process by allowing flames and gases to escape evenly from the briquette. The briquettes are sun dried for at least three days before being marketed. Marketing is targeted mainly to hotel owners and individuals in the Lukla and Pandung region. The briquettes are generally used for additional fuel in the large hotel stoves and for space heating in small metal stoves. The charring drum is a 220-litre drum of 1-2 mm thick sheet metal with a 5 cm gutter for an 8 cm high water seal along the upper rim. Inside the drum a perforated cone with a chimney is placed (the cone has about 200 holes of ½ inch). The metal of the cone and chimney is 2 mm. The covering lid provides a water seal. The drum and drum components are tarred against rust. The drum alone weighs about 40 kg. The current design can be transported by one person and has a life span of more than three years with continuous use. The complete charring drum set costs about NRs. 12-15,000 in Kathmandu. Smaller (100 litre and lighter) drums have been tested, but these do not give a practical output because the batch is too small. The filling of the 220-litre drum with dried biomass material and subsequent firing requires about two hours, whereas the cooling down of the drum (one batch) also requires about two hours. A total one-day production would therefore consist of two full cycles and would produce a combined total of 300-350 litres of loose charcoal. 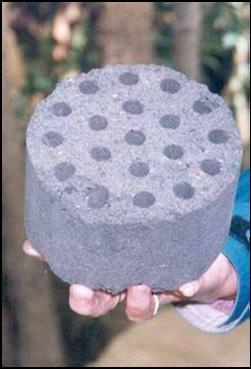 A fixed-dome stone construction is used in India for making charcoal from woody biomass. The making of charcoal from fine forest waste products, however, does not seem to give a good result in such a dome and is therefore not recommended by the CEE. 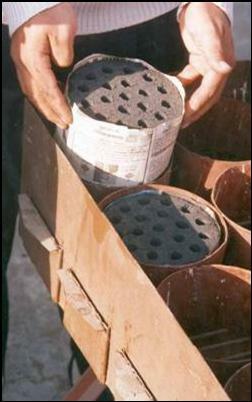 The charring drum is placed on three bricks and the perforated cone with chimney attachment placed inside. An entire load of chopped (1 ft. length) woody biomass and forest waste material is stacked next to the drum. 1. The drum is filled around the funnel base with a loose layer of easily burnable material and ignited. The biomass material should not burn completely to become ash. 2. After the first portion of biomass material starts to burn, another layer of biomass material is added, covering the burning layer. 3. The chimney extension is then placed on top of the inner chimney. 4. More biomass is placed onto the fire, avoiding that the fire extinguishes. The white smoke will now escape through the chimney. 5. The entire drum is gradually filled with the biomass, leaving sufficient space for smoke to escape. 6. When the smoke starts turning from white (containing water) to light grey and blue, the additional chimney pipe is removed and the lid placed on the drum. The gutter is filled with water. 7. The fire will slowly extinguish inside the drum and the biomass will be charred in about two hours. Let the drum cool down for a few hours. The charcoal which is produced in the drum needs to be crushed into small particles for filling into the mould. This can be done by using grinding stones or by a special grinder. The grinding stones follow the same principle as for the grinding of flour and produce a very fine dust. To reduce this awkward and very dusty work, CEE has developed a grinder that reduces the dust generation and produces particles which are less fine. As an alternative a dusk mask should be worn. The CEE grinder costs about NRs. 10,000. The hand mould consists of three parts and is manufactured by local blacksmiths from thick steel plate (5 mm) and smooth iron concrete reinforcement bars (12 mm). The mould is 90 mm high and has an internal diameter of 5" (127 mm). The 19 holes in the bottom are 12.5 mm (½ inch) to allow easy lifting of the pins and briquette out of the mould. Handles are 10 mm. The mould costs NRs. 5,000. Hand moulding requires a 5 kg metal weight to tap the mixture into the mould. This, however, does not produce a high briquette density. Estimated moulding pressure may vary between 2-3 kg/cm2. One person can make about 30 briquettes per hour with hand moulding, provided the charcoal-clay mix or paste is ready. It was noted that the non-precise positioning of the 19 pins (in a star pattern) on the mould base would allow the base plate to be fitted in only one position. During the manufacturing of new moulds it is recommended to use a precise welding jig for the 19 pins and a drilling jig for the holes. This way the perforated plate can be placed in any position over the 19 pins. The weight of the hand-made, dried briquette is about ½ kg. Overall manufacturing cost is estimated to be around NRs. 2.50-3 per piece, whereas the briquette can be marketed at about NRs. 4 per piece. The local cost of pure charcoal (used by blacksmiths) and copper workers is about NRs. 8 per kg. CEE, with the financial assistance of the AEPC, had started to develop a pedal-operated briquette press. The press would provide an improved compacting power of about 1000 kgf, which translates into about 10 kg/cm2 on the briquette. The briquette would be compacter and stronger than the hand-moulded briquette, thus providing longer burning time and better transportability, factors which can be of importance in the marketing and acceptability by its users. The cost of the pedal-operated press in Kathmandu would be about NRs. 25,000. A testing period and precise budgeting would be needed to assess if the additional equipment costs can be recuperated from a better product with a higher price. Pure woody biomass charcoal would produce about 28 Mega Joule/kg. A well compacted, dried briquette has a weight of about ½ kg. At high altitudes the briquettes can be adequately dry, but at lower altitudes their humidity can exceed 15%, thus reducing the energy value. Ø Hardwood woody biomass charcoal briquettes with 20% clay content would produce about 18 MJ/kg or about 9 MJ/briquette. In practice this would heat 2 litres of water in 15-20 minutes using the insulated (one briquette) metal stove (from about 20ºC - 98ºC at 1300 m altitude). The total burning duration of this briquette is about 1.5 hours. Ø Forest and agricultural waste charcoal briquettes, also with 20% clay, would produce about 12 MJ/kg or 6 MJ per briquette, depending on the composition of the charcoal. In practice this would heat 2 litres of water in 30-45 minutes, using the single briquette stove. The total burning period of one briquette would be about 1 hour. Because the Banmara-charcoal type is less pure, more volatile particles will be emitted during burning, which makes them less convenient for use in fully closed living rooms. Ø In China and Tibet some types of briquettes are made from charcoal to which coal dust (Anthracite) is mixed. These also have a higher caloric value, but produce more volatile particles and bad gasses than the charcoal briquettes. These must be used outside the house/room or require a very well ventilated kitchen (photo page 9). Ø Lignite briquettes were tested a few years ago by RONAST in Kathmandu, with some funding from JICA (Japan International Cooperation Agency), but results were not very satisfactory due to low caloric value and rather high particle and undesirable smoke emissions. Coal was used in combination with the Banmara vegetation. On some occasions these coal-Banmara briquettes were promoted as alternative energy source, but the emissions of large quantities of smoke particles and NOx and SOx gasses makes the product only useful for use outside the house or workshop. Because of the coal-gas emissions, this coal product cannot be considered as being environmentally advantageous. The metal stove fits one briquette of ½ kg inside. The stove in Pandung was made from scrap metal and old oil drums, 0.6 mm thick. The lined stoves of CEE had thinner sheet metal. Two models were presented by CEE, one with a one-inch thick inner lining of clay, the other with cement. The inner clay lining would be dried and partly cooked by the briquette fire. The cemented lining would become burned and with time disintegrate. Both are easy to replace. The inner lining will conserve heat towards the centre of the stove and increase the heat efficiency when used for cooking. In addition, the briquette will burn more completely with the lining than without. 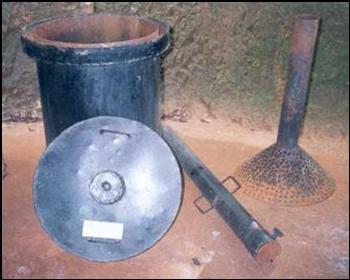 In the case of the Pandung stove, the inner lining had been removed, possibly because at the higher altitudes the small portable stove was used only for space heating (see photo below). 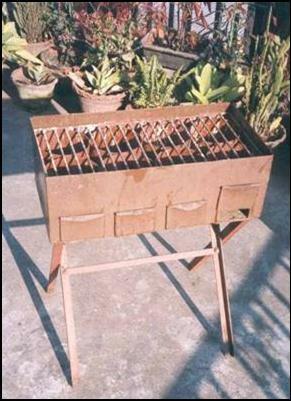 Because charcoal is frequently used for barbeques and by restaurants requiring large heat capacity for cooking or grills, CEE developed a metal barbeque stand in which eight charcoal briquettes could be placed. Ventilation holes were provided in the bottom through which the briquettes could be fired. This barbeque model would cost about NRs. 4,000. 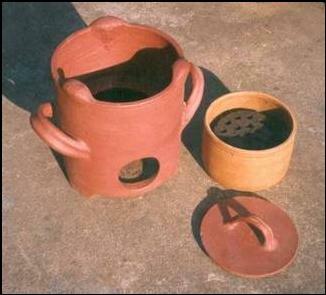 CEE has manufactured a prototype portable baked clay stove that can be used for either space heating or cooking. The unit may be rather fragile for its use. 1. The briquettes are not very much in demand, probably because they have a large solid (30% clay-soil) content and subsequently produce large amounts of ashes. 2. The briquettes are not very strong and disintegrate rapidly, thus making them impractical for transportation over large distances (see photo page 15). 3. The making of the briquettes was a dusty affair and disliked by the women because of the high emission of black charcoal dust. WWF supplied dust masks to the women. 4. The metal stoves used had the inner lining from clay removed (see left-hand photo page 6). 1. The resulting briquette is a standard round size [about 5" (12.5 cm) diameter and 3" (7.5 cm) high]. In other regions of the world similar sized round briquettes are manufactured. 2. The stove is locally manufactured by metal workers and is commonly made from recycled sheet steel using old oil drums (0.6 mm / 22 gauge or thinner) as basic source material. 3. The stove allows only one briquette to be burned at the time, thus requiring for every new briquette also new burning material for starting the fire in the lower part. 4. The height inside the stove was too low for the briquette and the pot supports were actually lying on top of the new briquette, causing damage to the fuel brick. 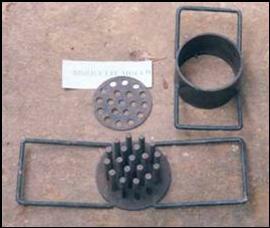 As a result the burning fire/gas from the briquette would have difficulties emerging from the holes. The height of the stove is less relevant if the stove is only used for space heating. 5. When used for cooking, the stove did not have a fire shield around the pot, thus having a low efficiency. 6. 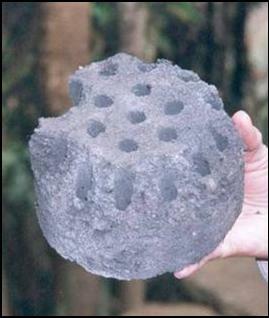 The ash plate in the middle of the height of the stove had 19 hole punched into it (diameter about ½ inch). This would require the fairly exact positioning of the new briquette holes over the holes in the ash plate. This is not a serious problem. 7. The side space around the briquette inside the stove was rather wide, more than one inch, as compared with the actual minimum space needed, about ¼ inch only. This was caused because the one-inch insulating lining had been removed. The removal of the lining would not increase the heat transmission. Instead, the combustion would be less complete without the insulation and instead of more heat it would burn with less heat and produce more un-burned gasses. 8. The ventilation or air access hole under the ash plate was rather large (more than 10 cm x 10 cm) and there was no means to regulate the air intake. The hole was kept large to allow a small fire to be made under the ash plate for starting the briquette burning. 9. The overall ventilation space around the briquette would allow the briquette to burn rather fast and uncontrolled for a limited period. 10. The briquette already crumbled at the corners with handling. This was caused by a too high soil content and insufficient compacting/binding during production. 11. Villagers complained about large quantities of ashes. This is caused by a too high soil content and removal of the thermal insulation (lining) of the stove which causes a complete burning. The space heating capacity due to the removed insulation would actually be decreasedl. Simple or clear information about the briquette were apparently unavailable or not easily accessible from the WWF Nepal Programme office in Pandung. There was no knowledge on where to get information on the improvement of the production process. From Tibet, where these are mass manufactured and very popular, a sample 3-briquette stove can be easily obtained. The Tibetan traders who regularly visit Khumjung, Namche Bazaar and Lukla villages during the tourist season would be able to bring a new or used example. 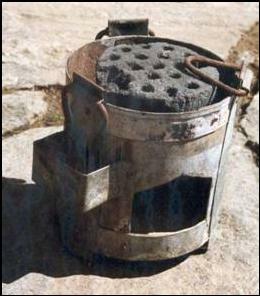 The Tibetan copy of the briquette stove can be studied by local metal workers and copied. It would be simpler to negotiate with some trader to bring a copy of the Tibetan stove, rather than making new elaborate drawings, and then trying to explain these drawings and the required end-product to local metal workers. A. There is on this high altitude plateau (4000 m / 12,000 ft.) absolutely no firewood available nor charcoal from woody biomass. B. All cooking fuel needs to be brought into the region and transport costs are rather high. 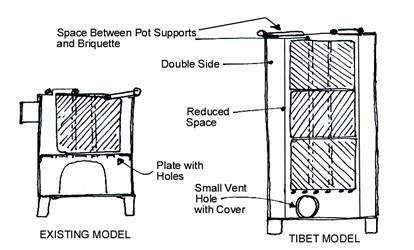 C. The Tibetan briquette stove is thermally insulated (double wall) so wind cooling is minimal. D. The model allows for three briquettes to be placed on top of each other, so a hotter fire and a fire of longer duration can be generated. 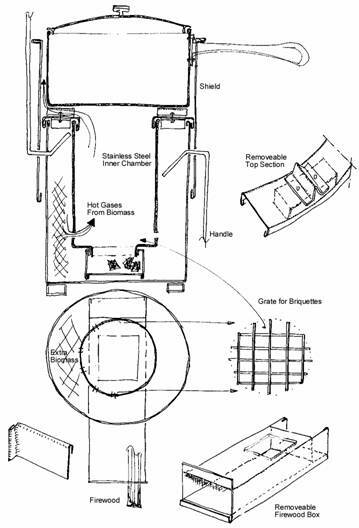 E. The model comes with special thongs that allow the higher briquettes to be placed exactly in the right position on top of the lower briquette, lining up the vertical channels. F. The model can be well regulated through two times 2-2½ inch round pipes and corresponding closing lids/caps, thus precisely allowing to temperate the air and oxygen intake and reduce burning (in the picture some caps are removed for increased burning). G. At the bottom of the stove the ash plate is an open grating and allows sufficient air to get to the briquettes from below, without the need of precise positioning of the bottom briquette over holes in the ash plate. H. Pots and kettles placed on the stove have a wide base, as wide as the insulated stove, so the use of the fire heat is optimised. I. Briquettes are of strong composition, marketed in large packs (two or three dozen) and have minimal damage during transport. J. The stove does not come with a wind shield. K. Briquettes include ground coal (Anthracite) that has a higher heat value (caloric value) than charcoal and agricultural residues. L. Because of the coal content, the briquette stoves are used outside the house or restaurant to allow the poisonous gases safely to escape. M. The wire handle allows easy transportation. The following sketch provides the main points of improvements that can be realised in the stove design. On the right-hand side the improved model. In making a new model in for Lukla, this model needs to be field tested with the potential users, such as the trekking companies and porters. It is also suggested to make a 2-briquette model with a wind shield. The success of a new product depends on the level of acceptance by the customers (see ANNEXE 1 for points to consider). The table in the ANNEXE 1 provides a resume of the most significant points indicating why a product which provides energy from biomass is marketable or not. - Few alternative energy sources are available, especially not at the high altitudes. - Currently high prices are being paid for buying and transporting fuel. - Certain types of cooking energy need to be mobile for trekking groups. - With clean charcoal the stove is useful for space heating. - The energy (caloric) value of the charcoal briquettes is low as compared to kerosene. - The fuel product (briquette) falls apart, is messy and not easy to transport. - The weight of the product is rather high for carrying at very high altitudes. - The stove is not very adequate for the current cooking habits or needs. - The stove has no insulation or wind shield that would improve efficiency. When improving the design of the stove, first the product itself and subsequently the making and marketing of the entire product needs to be assessed. Each of the positive points need to be exploited, whereas the negative points need to be eliminated or reduced. An overview and cost calculation of each of the points (reducing or enhancing) should be made before an improvement programme for stoves and briquettes is developed. The high altitude areas have a rather slow tree regeneration. Tourist trekking areas often lay between 2000 m and 4000 m (6,000 ft. and 12,000 ft.) and have a considerably slower wood and biomass regeneration than at lower altitudes; on average about ten times slower. 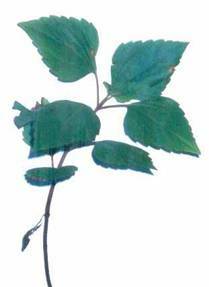 In the Terai 500 m (1500 ft.) young hardwood trees can produce about 100 kg. wood per year. At 2000 m (6,000 ft.) this is, compared to the Terai, about 20 kg. wood per year. At 2300 m (7,000 ft.) this will be reduced to about 15 kg. wood per year. At 3000 m (9,000 ft.) this is only about 10 kg. wood per year. At 3600 m (11,000 ft.) this is maybe between 5-10 kg. wood per year. Above 4000 m (12,000 ft.) no more trees will grow. The production of the biomass briquettes is mainly done from agricultural waste and forest by-products, such as fallen needles, pine-cones, Banmara and wild forest grass. When charcoal is made, an additional demand can also be made on the local wood growing capability. With the current slow re-generation of biomass and wood at this altitude (1/10th of that in the Terai), it needs to be assessed if the production can be renewable and sustainable, or if the demand is larger than the production. Sawdust from sawmills and wood shavings may be available in limited supply in the lower areas, but this supply will stop when a complete ban on cutting of timber and firewood is enforced. Most of the agricultural residue is only seasonally available, such as the chaff from rice, dried bean stalks and peels, dried maize stalks, etc., materials that can sometimes be eaten by the cattle. This material is also used as stall bedding and therefore not always available for briquette making. In addition the villagers use the indigestible agricultural waste for kindling their fires throughout the year. Therefore, the amount of available agricultural waste in the village may be very little. For other regions of the country the woody biomass is very useful for making charcoal briquettes as this material provides a high quality charcoal and the stoves which burn with this material can be used inside the house. In the major cities ample supply of wood shavings may be available from a multiple of small carpentry shops. Manufactures of Beehive charcoal briquettes may be able to make contracts for the collection of this hardwood waste. During the same rounds (on bicycle) to collect the wood waste they can deliver the briquettes to users. Coal (Anthracite) has not been found in the area, but can be imported into the region from India by truck to Kathmandu. Transporting this from Kathmandu to the high areas having no road access will only be at very high costs. Two reasons for success of the Tibet briquette may be (1) the Tibetan coal-dust briquette has a higher caloric value and (2) road transport is available. The agricultural residue briquette, however, may be able to burn faster and generate the same amount of heat for a short time span. Low quality Lignite is available in the Kathmandu valley and possibly in other regions, such as in upper Mustang, but this material has a much lower caloric value than coal or Anthracite. Because it has a high sulphur content and a lot of volatile matter, it needs to be initially ignited outside the house and burning strongly before it can be brought inside and placed in a well ventilated area. For use in kitchens having stoves with good chimneys, the coal briquette may be a good energy source and supplement for very high altitudes. In a wooded area, with access to forest by-products, branches, some firewood and cow-dung for fuel cakes, the higher price villagers are willing to pay for another heat source for cooking is limited. The value of the new energy source will increase if people are living farther away from the wooded area and transport (delivery cost) of biomass or firewood is rapidly increasing. The price a person wants to pay for an alternative energy source depends largely on the level of comfort the person receives from using that heat source. For example, electricity or gas for cooking is very convenient. Charcoal briquettes are convenient when they do not generate smoke and the heat source is easily transportable, both aspects not applying to an open fire. The additional product-related costs are also relevant, such as transport, storage, easy replacement, availability, equipment needed, matches, dirt, smoke exhaust, pots and pans, cleaning, etc. Using the charcoal briquettes has a number of advantages and disadvantages, which the user will compare with other locally accessible heat sources. Considering the above points it can be assumed that only in areas where firewood is absolutely forbidden and no electricity exists for cooking purposes, the briquette can possibly effectively compete with kerosene. Kerosene, however, has a very high caloric value; and depending on the equipment, a small amount can generate highly concentrated heat. The preliminary conclusion is that near the tree line (3000 m / 11,000 ft.) and higher an improved briquette stove can be an interesting product if the prohibition of using firewood is adhered to. At 5000 m (15,000 ft.) and higher the added value and high caloric value of kerosene (as compared to weight and transport costs) may make briquettes again less interesting. This needs to be assessed and depends on the efficiency of the stove and briquettes. The purchase cost of the product has a lot to do with convenience as indicated in point B above. If the briquette falls apart and creates a mess or cannot be easily transported, it becomes less attractive for the user. Therefore the briquette has to remain solid. First, the internal binding must be good; secondly, it must be transported in a protective casing or box to avoid damage by transport over the long trekking routes. It appears that the 30% soil mix with the charcoal is a too high percentage, adding weight, reducing heat generating capacity and not good enough in binding. As binding material it is recommended to add soft wet clay (about 20% maximum), mix this with the dry agricultural charcoal, press the briquette into shape at high pressure and let to dry. Drying can be done in the open air or in a solar dryer, using a simple UV resistant plastic cover at the high altitudes. The quality of the clay will determine the quality of the bonding. A 1½ litre transparent plastic bottle is half filled with finely crushed clay-soil and a spoon of salt. The bottle is then filled up to ¾ with clean water. The bottle is shaken for about 2-3 minutes until all particles are fully mixed and the clay is suspended in the water. The bottle is placed on a fixed point and observed regularly. First all the solids, such as sand and small pebbles, will sink to the bottom. Then a layer of silt will form on top of the sand. Gradually, over a period of several hours, the clay will settle on the sand. Organic matter will remain floating on top of the water. The above test will assist the manufacturer of the briquettes to select the best clay soils. If the soil contain too much sand and silt, these must be washed. In large tanks the fine clay can be separated using the same principle as with the bottle test. In mixing the dry charcoal material with the fine wet clay, the clay content should be kept to a minimum. The internal binding of the briquette can be also improved by increasing the pressure in the mould and/or by adding starch glue. CEE has developed a pedal-operated briquette press that can realise a much higher pressure (1000 kgf or 10kg/cm2) than can be generated with the hand compacted mould. The weight of the briquette will be slightly increased as more charcoal enters the mould. The burning of the briquette will therefore also be longer. With a charcoal paste containing pure clay, there probably will not be a need for additional compaction. The dry clay can be wetted with water that has high starch content. Starch is found in rice, potatoes and pasta. Leftover food products can be soaked to produce a starchy water. The dry clay should be mixed with this starchy water. Tests should be realised to determine whether or not this activity is economical and the amount of starch needed. The binding by starch occurs after drying. Special transport containers should be designed and field tested for practical usefulness for transport by humans or by Yak/Nak/Zopje. Considering that porters or yak may carry a variety of articles, a container of about 20 kg content weight can be designed. The briquettes inside the container can be packed in waste paper, which in turn can be used to light the briquettes in the stove or cooking stand. The entire production process in Lukla/Pandung needs to be analysed to assess where economies of efficiency improvements can be generated. The activity was introduced in the high altitude areas as a micro-industrial activity or an income-generating activity. If the product and the marketing options are again assessed and adjustments made, it could become a viable income-generating activity for remote areas and can be a contribution to Renewable Energy sources. Considering the expanse of high altitude areas in Nepal, and the high demand for improved cooking methods and access to heating fuel, serious efforts should be made to optimise the production and use of Renewable Energy sources, especially if this also provides some income-generating activities for the local population. The biomass charcoal briquettes can be developed alongside biogas reactors with greenhouses and solar water heaters. The need for room heating will reduce with proper thermal insulation. Clear, simple and concise information should be readily available to the public. Documentation and training should be available to local producer groups so they can learn how to make the best biomass charcoal briquettes, know where to get the moulds, compacting machines, stoves, tools and other appliances for the most efficient manufacturing, and what everything costs. Manufacturing manuals should be available in local languages and well illustrated with drawings and photographs. Manufacturing, however, should not be considered when the number of negative points is exceeding the number of positive points in the annexed table. After resolving the most important points, some of the remaining negative points may be minimised, but all have an influence on the local marketing conditions and price. Marketing options should therefore be studied before training and industry development is undertaken. Poor quality briquettes disintegrate during transport. Worldwide a continuous development is ongoing to improve biomass and firewood stoves, making them more fuel efficient, comfortable (practical) to use, and reducing emission of hazardous gasses. One of the improved portable cooking stoves is the Rocket Stove developed by Aprovecho. The special advantage of transportable stoves over other “improved cooking stoves” is that they can be ignited outside the house (the short period when smoke is produced) and brought inside to use. Most of the mud-based improved cooking stoves are in fixed position (in the kitchen) and still produce smoke when lighted. When the stove is burned out, the transportable stove can be taken outside the house for cleaning. The small transportable stoves required small pieces of wood (an disadvantage for the person who needs to chop the wood), having a cross section of about 1-1½" and not longer than one foot. These small wood sections burn much better than thick wood. The person tending the fire is required to constantly feed the burner to maintain adequate heat during the entire cooking process. The shield around the cooking pot traps a substantial amount of heat from the flames and the hot gasses escaping upwards along the outside of the cooking vessel. This shield design is highly effective in windy areas and should be made applicable for all outside stoves in high altitudes. The FoST stove has a loose shield that is more than often not used. The special advantage of the charcoal briquette stove is that inside the house the smoke emission is minimal and comfort is maximal, as compared to the woodstove, because the cook does not have to tend the fire all the time. · An elbow or Rocket-type stove with a vertical component of 5" diameter and with an internal height of two briquettes or minimal 7" (13 cm round x 18 cm high). The two briquettes will provide a fire of longer duration, whereas the firewood opening allows the fire to be supplemented for some time without the need for a complete new briquette lasting for an hour. A grip-tool needs to be supplied to place one briquette exactly over the other. · The air intake of the firewood opening simple to must regulate. This is not the case with the current FoST stove. · The shield is to be fixed to the stove body and should be adjustable, according to the height of the cooking pot. In the skirt an opening must be available for a pot with a long handle. · To assure a good fit between the cooking pot and the shield, an accompanying cooking pot, which is only ¾" (2 cm) smaller than the shield and having a lid, can be supplied along with the stove for optimum efficiency. 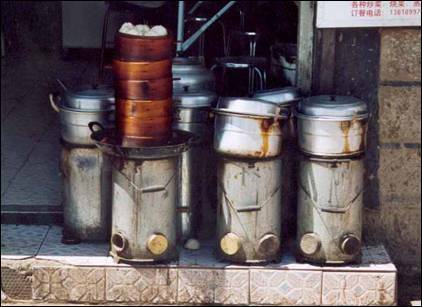 · The stove needs to have a long carrying handle, like the Tibetan briquette stoves. This way the entire stove with cooking pot can easily be carried around and placed in another location. · The inner chamber should be lightweight to minimise heat loss. Because a thin sheet metal chamber will burn through fast, the FoST stove has a rather thick plate. An alternative would be a thin stainless steel inner chamber, which better resists the fire and looks very neat. · The space between the stainless steel inner chamber and the outer chamber functions like an insulator and can be about one-inch thick, giving the stove an overall width of 7". · The new model should have interlocking components and can be changed, if necessary. Welding should be minimal and damaged components should be replaceable without the need for replacing entire stove. · Because the main feature of the stove would be that it is movable around the house, the new two-briquette elbow stove can be called a "Satellite Stove". In Myanmar, a biomass Paru gasifier stove has been developed in which biomass can be stuffed in the outside cavity wall of the stove. When the biomass gasifies, it creates a clean flame in the interior burning chamber. With the Aprovecho or Satellite Stove, a wider cavity wall can be made. In addition, the top section can be modified in such a way as to enable easy assembling/disassembling. With this construction biomass or agricultural residues can be added into the cavity space. If holes are made in the bottom of the stainless steel inner lining, the gas emitted from this biomass will burn inside the central chamber, thus adding to the heat with clean fire. Such a design can be developed as a further option. Copied from the World Bank Technical Paper Number 242, page 14. What Makes People Cook with Improved Biomass Stoves? Comparative International Review of Stoves Programs by Douglas F. Barnes, Keith Openshaw, Kirk R. Smith, and Robert van der Plas. "...it is now understood that women in fuel-short areas often are able to achieve efficiencies in their traditional stoves substantially greater than the 6 percent assumed in many analyses. Finally, planners have shed expectations that huge improvements in efficiency alone would make stoves irresistible and that they would need to do little monitoring, sampling, or statistical work to assess programs' efficacy." 1. Program targets region where traditional fuel and stove are purchased or fuel is hard to collect. 2. People cook in environments where smoke causes health problems and is annoying. 3. Market surveys are undertaken to assess potential market for improved stoves. 4. Stoves are designed according to consumer preferences, including testing under actual use. 5. Stoves are designed with assistance from local artisans. 6. Local or scrap materials are used in production of the stove, making it relatively inexpensive. 7. The production of the stove by artisans or manufacturers is not subsidized. 8. Stove or critical components are mass produced. 9. Similar to traditional stove. 10. The stove is easy to light and accepts different-sized wood. 11. Power output of stove can be adjusted. 12. The government assists only in dissemination, technical advice, and quality control. 13. The stove saves fuel, time, and effort. 14. Donor or government support extended over at least 5 years and designed to build local institutions and develop local expertise. 15. Monitoring and evaluation criteria and responsibilities chosen during planning stages according to specific goals of project. 16. Consumer payback of 1 to 3 months. 1. Program targets region where traditional fuel or stove are not purchased or fuel is easy to collect. 2. People cook in the open, and smoke is not really a problem. 3. Outside "experts" determine that improved stoves arl required. 4. Stove is designed as a technical package in the laboratory, ignoring customers' preferences. 5. Local artisans are told or even contracted to build stoves according to specifications. 6. Imported materials are used in the production of the stove, making it expensive. 7. The production of the stove by artisans or manufacturers is subsidized. 8. Critical stove components are custom built. 9. Dissimilar to traditional stove. 10. The stove is difficult to light and requires the use of small pieces of wood. 11. Power output cannot be easily controlled. 12. The government is involved in production. 13. The stove does not live up to promised economy or convenience under real cooking conditions. 14. Major achievements expected in less than 3 years, all analysis, planning, and management done by outsiders. 15. Monitoring and evaluation needs are not planned and budgeted, or criteria are taken uncritically from other projects or not explicit I y addressed. 16. Consumer payback of more than 1 year. The Nepalese Government subsidised in 2002 kerosene importation for about 30% (bringing the price down from NRs. 27 to NRs. 19). This cost the government about Euro 3.5 million in subsidy for low-income people in remote areas. The kerosene at high altitudes costs about NRs. 120 per litre, mainly due to high transport costs. The Biogas Partnership Programme of SNV-Nepal is developing an improved biogas reactor that will satisfactorily work at altitudes over 2000 meter and substitute about one ton of firewood for biogas, for each cow. Banmara weed or Eupatorium adenophorum, Euphorbia royleana, Parthinium bisterophorus are undesired forests weeds. One Euro is about 80 NRs. The total weight of the charcoal is about one-quarter of the original weight of the woody biomass put into the drum. For forest waste products the remaining charcoal weight is less than half of the original weight. The grinder has not been extensively tested on sturdiness and durability and seems to be rather expensive for the cottage industry. Alternative Energy Promotion Centre of the Ministry of Science and Technology of Nepal. Lignite is a low quality coal product that is mined in the Kathmandu valley. Anthracite, a high quality coal with high caloric value, is brought into Nepal by lorry from India. In high altitude areas where energy is scarce and costly, these Lignite or coal briquettes can be an interesting supplement in kitchen stoves which have chimney attachments. The salt is added to speed up the process of sedimentation. In high altitude areas, more than 50% firewood (for space heating) savings can be obtained by thermal insulation. Aprovecho, with Dr. Larry Winiarsky has realised the Rocket Stove. This is a stove with an elbow-shaped fire chamber from which the burning chamber is insulated and includes a skirt around the cooking pot. The better the insulation of the burning chamber and the skirt around the pot, the more fuel efficient is the stove. This model has been adopted by Foundation for Sustainable Technologies (FoST) in Nepal. Most of the smoke which the biomass produces has been already expelled during the manufacturing process. This means that the overall production is not smokeless. However, burning the charcoal produces a minimal amount of smoke. The Paru Stove has been developed by the San San Industrial Cooperatives (SSIC) with the assistance of Dr P.D. Grover of the IIT Delhi. This stove gasifies the biomass (rice husk) in the outer chamber, giving a clean inner chamber flame. 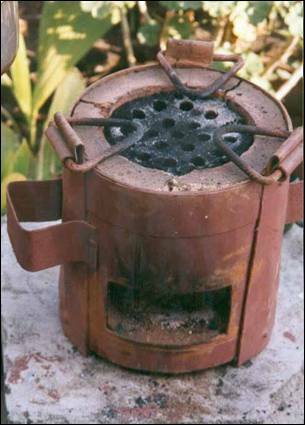 Details of this stove can be found in the FAO-RWEDP Report No. 56 (website: www.rwedp.org/acrobat/rm56.pdf). The points that are to a certain extent applicable to the Lukla briquette stove and the used briquettes are printed in BOLD. Other points are not known or not assessed.